With characteristic Fabergé wit and verve, Fabergé brings its passion for craftsmanship and inventive design to the realm of cufflinks and accessories. 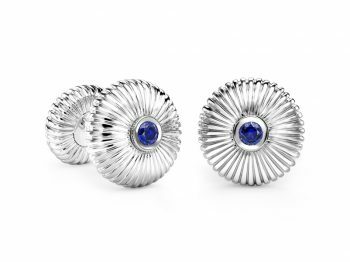 Impeccably crafted from the finest materials and gemstones, the collection draws inspiration from the many cufflinks, dress-sets and famous cigarette cases created by Fabergé in the early 20th century. 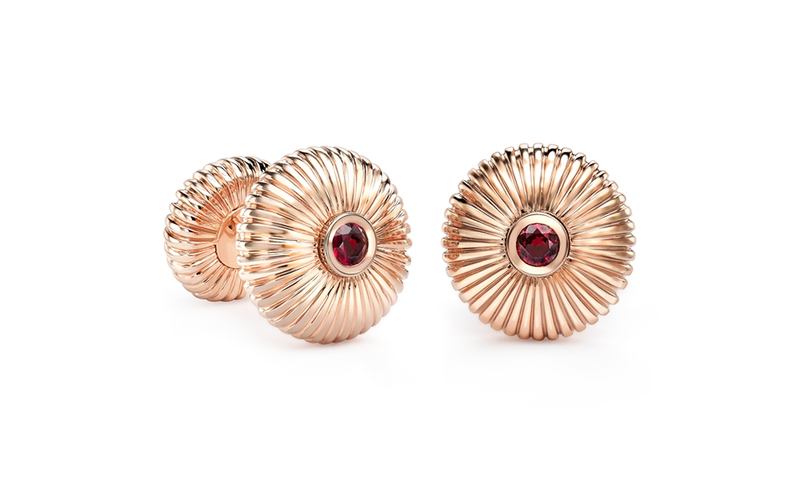 Fabergé Ruby Rose Gold Fluted Cufflinks feature round rubies, set in 18 karat fluted rose gold (12g). For IN-STORE purchases, the price you actually pay will include any taxes applicable in that jurisdiction. However, in some countries, for example the USA, the displayed or advertised price may not include sales tax which will be added at the time of purchase. You may be entitled to refunds from Customs when leaving a jurisdiction where you bought an item if you are permanently exporting the item. You may also be liable for customs duty or tax for items imported into another jurisdiction. If you are exporting an item you should check the tax implications with the authorities in the country of your intended destination. For ONLINE purchases, the prices displayed on our website for online sales depend on the country the goods will be delivered to, and for the countries in the drop down menu, the quoted price is the “delivered price” (i.e. includes taxes, insurance, shipping). 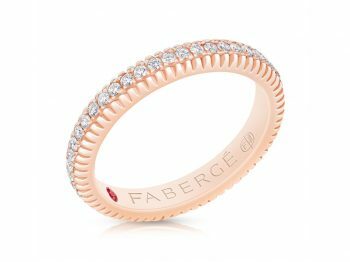 If you want delivery to a country not on the drop down menu, please contact sales@faberge.com. For deliveries to New York State, NY State Sales Tax will be added to the “delivered price”. We try to ensure that all our advertised prices are accurate, but errors may sometimes occur. If we discover an error in the price of an advertised item or an item you have ordered, we will contact you as soon as possible. You will have an option to reconfirm your order at the correct price or to cancel it. You may pay for your merchandise by credit card, debit card or bank transfer. If you are buying in-store you may be able to pay with cash but local stores will have to comply with local money laundering and other legislation which may restrict the amount of cash we are allowed to accept. All debit and credit card holders are subject to validation checks and if the issuer of your card refuses to authorise payment, we will not be liable for any delay or non-delivery. For online sales we will arrange for delivery to the delivery address but we and our agents reserve the right to delay or decline delivery to any address for security or other reasons. If delivery cannot be made at your chosen address, we will ask you to provide an alternative address. We take reasonable care to keep details of your order and payment secure but third parties are necessarily involved in processing your card information. In the absence of negligence by Fabergé, we will not be liable for any loss you suffer for unauthorised access to any data you provide us when ordering from our web site or in-store. If you buy ONLINE, many jurisdictions give you the right to cancel your order and return items for a short period after you have received them. In the European Union this period is 14 days. Where you bought online, we will honour any such period which is effective in the jurisdiction we delivered your merchandise to. 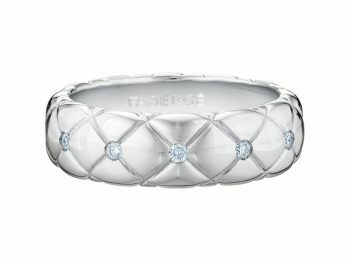 In order to cancel your online order under applicable law, you must write to us at our London address or email us at sales@faberge.com, using the subject heading “Cancellation of Sale in Cooling Off Period.” If you cancel under applicable law (where it is available) we will give you a full refund. You must return the full order to us at our London address at your cost, you must arrange for its insurance at the price you paid for it, and the items must be returned unused and in their original condition and with original packaging and certificates. Except where otherwise required by applicable law, we will not accept items returned if they are used or damaged or returned without their original packaging, or if the sale was not an online sale or if the item was specially made or personalised for you. In some jurisdictions you may be entitled to cancel online orders if they are not delivered to you within a defined or reasonable time from placing your order, and you have not agreed to a specific delivery date. In the European Union, the defined period is 30 days (unless you have agreed something else with us). We will try to get your order to you as soon as possible and we will honour any law applicable in the jurisdiction the merchandise is intended to be delivered to, that gives you the right to cancel for delayed delivery. If you wish to cancel under this law you should write to us at our London address or email us at sales@faberge.com using the heading “Cancellation of Sale for Non Delivery.” If you cancel under this law (where it is available) we will give you a full refund. Returns In addition to the legal rights provided in some jurisdictions to cancel your contract for sale (as above), we also offer all customers, both online and in-store, the opportunity to return unwanted items to us for store credit or exchange within 30 days of delivery of the items. The items must be returned within 30 days to the store where you purchased them, or to our London address if you purchased online, and they must be returned unused and in their original condition, with original packaging and certificates. We will exchange or give you a store credit note for returned items (at your option) to the price you paid for the item subject to any special conditions of sale. Items that have been specially made for you and personalised items cannot be returned under this policy. You must use the credit note at the same store (or online) you purchased the item from and you must use it within 12 months of the original purchase. We cannot give a cash refund for any part of your store credit but you can use it to purchase any available items. We will normally refund tax and duty on the item too, but we cannot do this for items purchased on the web site and you will have to take responsibility yourself for claiming refunds if they are available in your jurisdiction. You must arrange and pay for all insurance, post and packaging costs if you return goods under this policy. Where appropriate we will resize rings, free of charge within 90 days of purchase, but resizing will not always be possible. We will treat your request sympathetically, but we reserve the right to offer this service completely at our discretion.